Venom is a bad movie. 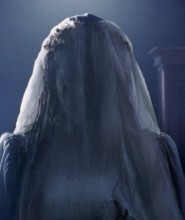 Maybe not The Amazing Spider-Man 2, Elektra, Batman and Robin or Catwoman sort of bad, but still pretty unbearable. This is more like on the level of The Fantastic Four (either the 2005 or 2015 versions; both are equally mediocre), 2003’s Daredevil (the one with Ben Affleck) or 1983’s Superman III (the one with Richard Pryor and where the Man of Steel fights his drunken doppelganger), meaning this latest comic book adventure isn’t without its moments but overall is still nothing short of a misbegotten waste of time. It doesn’t work, its nonsensical, slapdash plotting and overly frenetic, visually repellent action sequences making this film hugely difficult to sit through for all 112 minutes of its running time. Based on the Marvel comic book character created by Todd McFarlane and David Michelinie, the popular antihero first made his big screen appearance in Sam Raimi’s Spider-Man 3 back in 2007. Unlike that version, this time around everybody’s favorite friendly neighborhood wall-crawler is nowhere to be found. 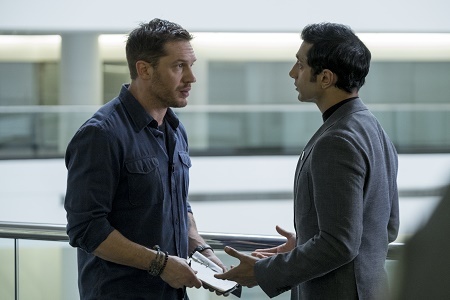 Here we are introduced to Eddie Brock (Tom Hardy), a hard-hitting investigative television journalist working for a station in San Francisco whose career comes to an immediate halt the moment he decides to ask wealthy entrepreneur and philanthropic industrialist Carlton Drake (Riz Ahmed) a series of tough questions that claim he’s nothing short of a criminal. In the process of getting fired, he also manages to undermine his lawyer fiancée Anne Weying’s (Michelle Williams) career as well, so it’s no wonder she cancels their engagement and kicks him out of their apartment with a justifiable anger that both vicious and decisive. Fast-forward six months and Brock is quickly getting down to his last nickel when suddenly a whistleblower working for Drake comes to him for help. They want to get the word out that something terrible is happening back at his corporate headquarters, something murderously not of this world. After getting access to Drake’s top secret laboratory Brock comes into contact with some sort of slimy black entity that infects every fiber of his DNA. Turns out, this creature, known as a symbiote, is indeed an alien visitor and it needs a compatible human host in order to survive on Earth. 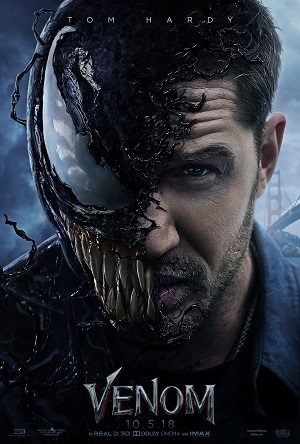 Calling itself “Venom,” he grants Brock a set of otherworldly powers that allow him to do things that normally wouldn’t be possible, the cost of which being that when transformed fully into this demonic monster sometimes the pair have to chomp down on human flesh if they want to keep their collective strength. Directed by Zombieland and Gangster Squad filmmaker Ruben Fleischer, this movie is a giant tonal mess that borders on incoherence. Whether he, the studio or writers Jeff Pinkner (The Dark Tower), Scott Rosenberg (Jumanji: Welcome to the Jungle) and Kelly Marcel (Fifty Shades of Grey) are at fault for this I honestly cannot say as blame looks like it could be tossed around fairly liberally. The truth is that, even for a motion picture that runs almost two hours and feels a lot longer, one still gets the odd sensation that there is a great deal of the intended narrative missing. It’s hard to tell how much of the comedy is intentional and how much of it isn’t as there were a number of instances where I felt like I was laughing when I probably shouldn’t have been. Toss in characterizations that are threadbare, half-baked and in one instance borderline inexcusable to the point of being offensive and there is precious little about this one that should get anyone excited to see it. 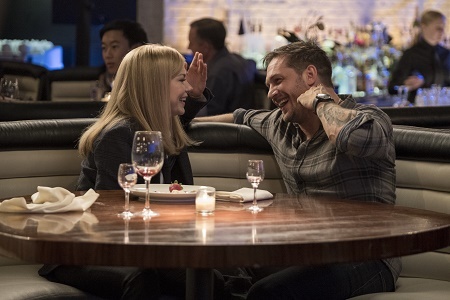 Even though he is arguably the worst investigative journalist ever depicted in a motion picture, Hardy stills ends up being far more winning as Eddie Brock then by all rights should be. Still, I liked his awe-shucks demeanor and his clownish mannerisms, something about the laidback way in which he slowly stumbles through this story oddly effective. The guy is a total schmuck and Hardy isn’t afraid to play him that way, the actor having a disheveled moxie that’s surprisingly endearing all things considered. But the rest of the cast? I don’t have the first clue why they’re all in this other than picking up a rather large paycheck. Williams has no character to play, none, and the fact she’s still able to make Anne almost worth caring about is a testament to her massive talent more than it has anything to do with this particular movie itself. Ahmed is in standard villain mode, and while he’s fairly good doing it there was never a moment I felt like Drake was any sort of physical threat, and that includes all facets of the story taking place after another symbiote enters into the picture and decides to bond with him. As for Jenny Slate, a marvelous actress who has already proven just how gigantic her talents are in films like Obvious Child and Landline, what Fleischer and the writers do to her made me all kinds of angry, the way her character is treated as shameful as it is frustrating. Earlier this year director Leigh Whannell made a low budget thriller about a quadriplegic given superhuman abilities thanks to a high-tech electronic device inserted into his back. 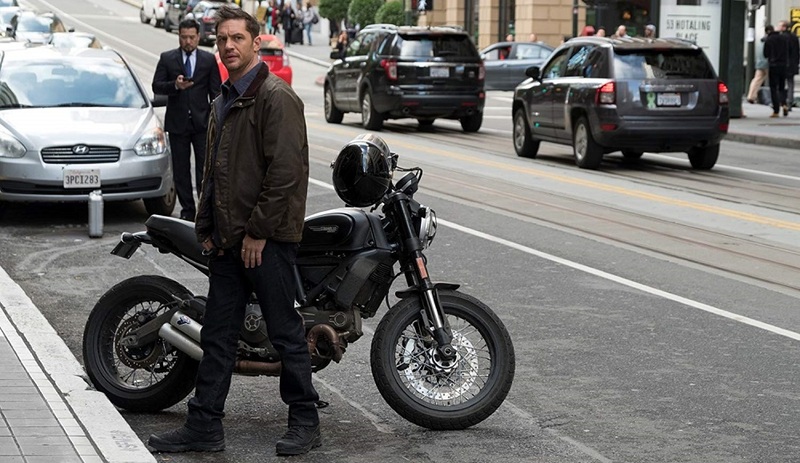 That movie was Upgrade, and it was a magnificent amount of fun, star Logan Marshall-Green taking the story by the horns and making something magnificent perfect out of it. It’s oddly similar to the plot dreamt up here, so for all those expressing interest in giving this comic book adventure a look I’d highly suggest picking Upgrade up for a look instead. I cannot, I will not, say the same about Venom. Overflowing in people doing dumb things, I feel in some ways the only thing I can really accomplish here is to state my dissatisfaction of the film and leave it at that. There’s so much more I could add but I honestly just don’t have the energy to do so. As already stated up front, this is a bad movie, and much like they did with the character of Spider-Man I’m starting to wonder if it’s only a matter of time before Sony throws up their hands in surrender and turns over the rest of the characters they own in the web-slingers universe back over to Marvel Studios to see what they can do with them. At the very least, whatever they come up with on how to utilize this demonic antihero can’t be any worse then what’s been done here, this dull, tediously frenetic misfire a superheroic failure that’s as instantly forgettable as it is enthusiastically obnoxious.